Joseph J. Kerski, Ph.D., GISP, Geographer, Esri. Figure 1. 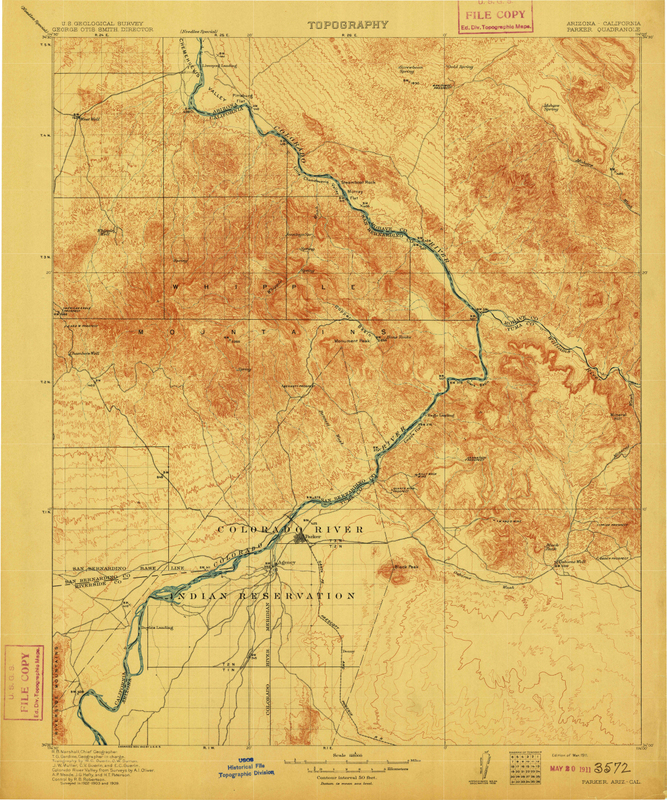 1911 USGS map at 1:125,000 scale of Parker. Figure 2. 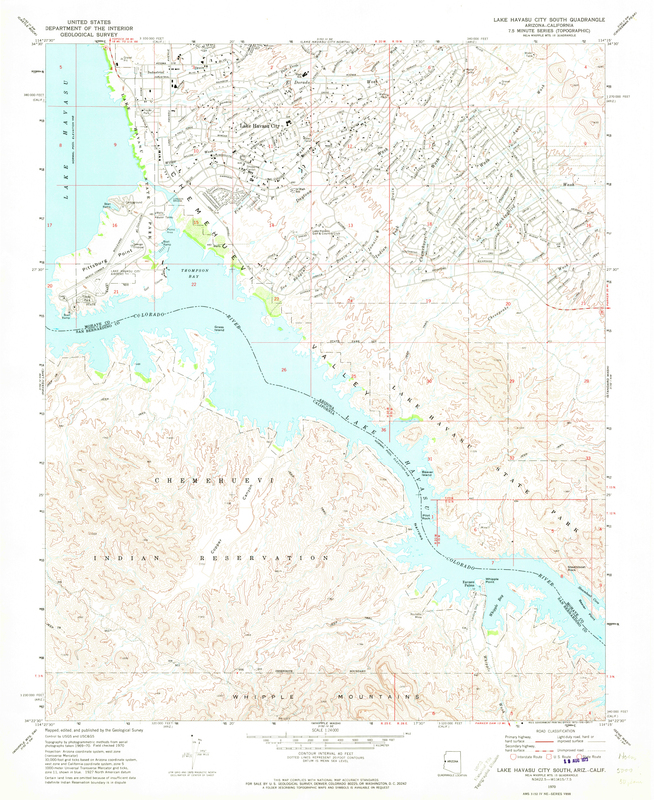 1970 map at 1:24,000 scale, Lake Havasu City South. Figure 3. 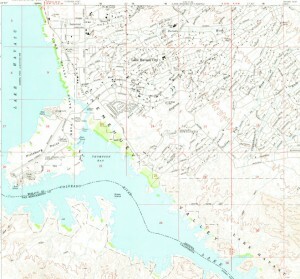 1994 map at 1:24,000 scale, Lake Havasu City South. One of the ways that humans have modified the landscape is in their attempt to make parts of deserts more habitable. Some of the most famous examples include the transformation of coastal fishing villages in the United Arab Emirates into major world cities, and the creation of resort areas around the world in Australia’s outback, Namibia, Morocco, and in the USA, including the cities of Las Vegas, Palm Springs, and Lake Havasu City. Parker Dam was constructed on the California-Arizona border on the lower Colorado River during the 1930s, as part of a project to employ people during the Great Depression, to generate electricity, and to provide water that could be pumped into aqueducts for agricultural, industrial, and residential use in other parts of Arizona. Like Hoover Dam upstream that formed Lake Mead, Parker Dam backed up an enormous reservoir, named Lake Havasu, the Mojave word for blue. For several decades after the time of its creation, Lake Havasu sat in a nearly empty valley, except for a few military personnel in the Army Air Corps who created a rest camp on the shore during World War II. But beginning in the late 1950s and into the 1960s, Robert P McCulloch began to acquire federal land there and encourage development. He began with a peninsula that was formed when the reservoir was created, which would develop as “the island.” One of his most well-known acts to attract attention was the purchase of London Bridge, which was disassembled piece-by-piece, and reassembled in Lake Havasu City, requiring 3 years and nearly $10 million. 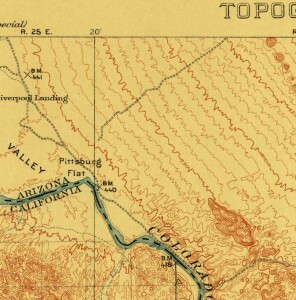 This connected “the island” to the Arizona mainland. By 2010, the city was home to 52,527 people, but is even more notable for being one of the prime destinations to which thousands of people flock in the winter. These people are known as “snowbirds,” as they seek refuge from their homes in the northern USA and in Canada. 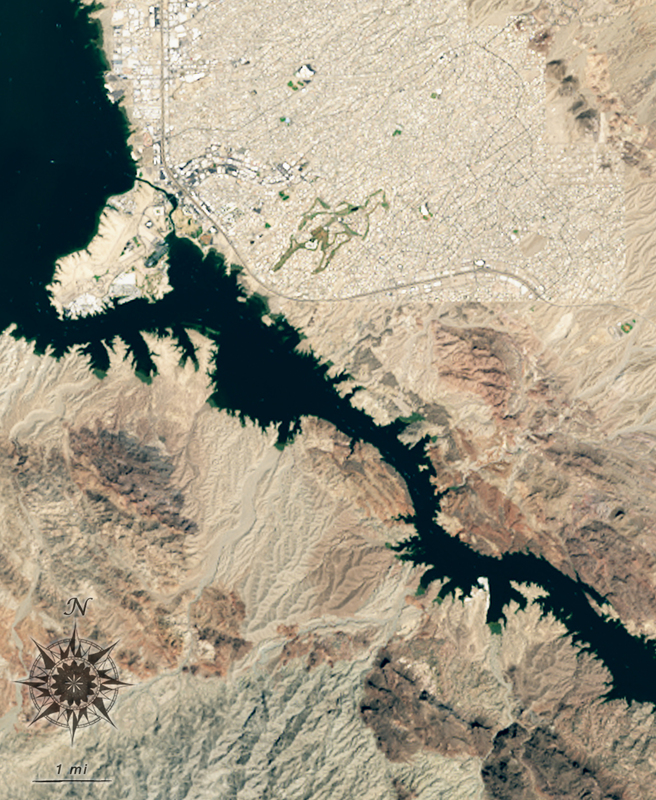 Thus, despite the fact that Lake Havasu City is extremely hot for more than half the year, with summer temperatures typically between 109 °F and 125 °F (43 °C – 50 °C), and the city receives only 4.29” (10.89 cm) of precipitation annually, the city is in many ways thriving and much of the land use in the area has changed. 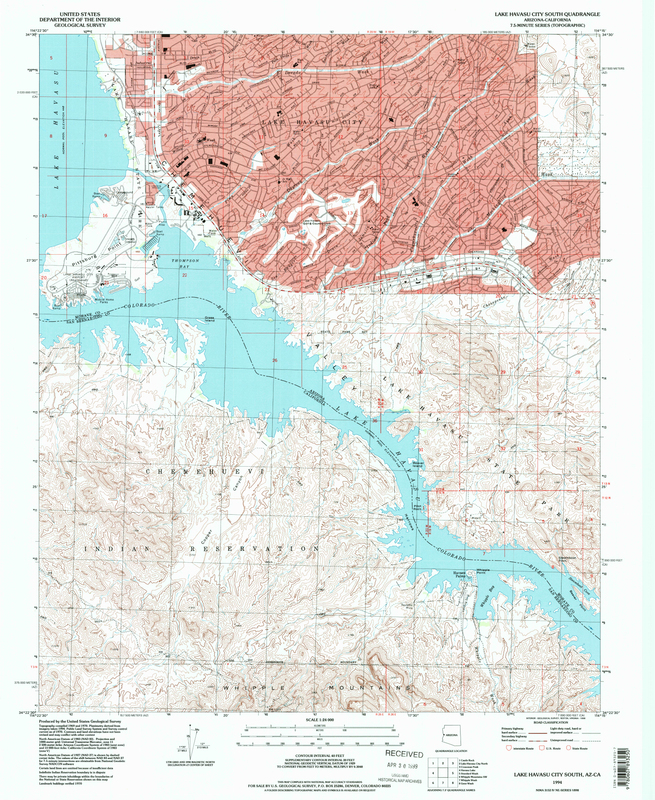 The extent of the changes on the landscape around Lake Havasu can be easily seen by examining the historical maps from the USGS-Esri Topographic Explorer, a tool that provides a timeline that enables the viewing of historical and current USGS maps at a variety of scales. 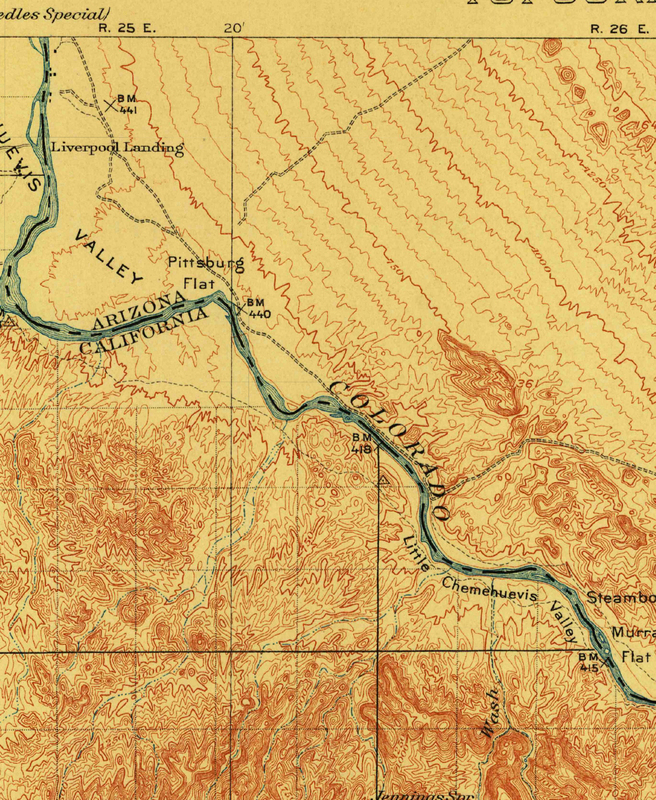 In Figure 1, the 1911 map of Parker at a 1:125,000 scale, the alluvial fan extending from the mountains to the east of the map to the Colorado is evidenced by the evenly-spaced contour lines. A single gravel road roughly follows the Colorado River, which also marks the boundary between Arizona and California. Another gravel road heads off to the northeast up the alluvial fan. 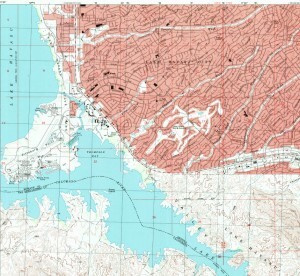 The second 1970 map of Lake Havasu City South (Figure 2, at a different scale) shows the newly formed reservoir, flooding part of the Chemehuevi Valley. An extensive road network had developed by this time, but the map shows few buildings. Thus, there are many roads, but still not very many houses. The distinctive road pattern was designed by C.V. Wood, who was hired by Robert McCulloch after McCulloch had seen how Wood had designed the road network for Disneyland. 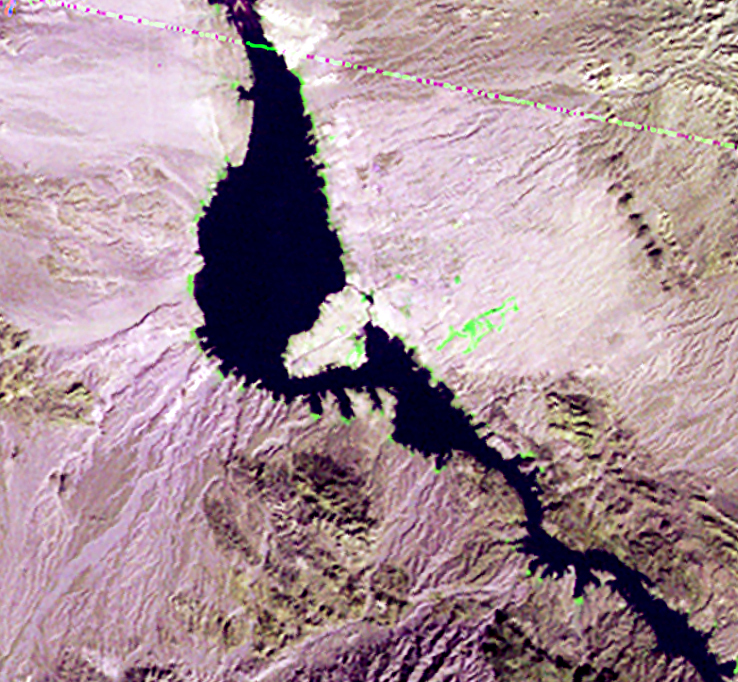 As shown on the third map (Figure 3, Lake Havasu City South, 1:24,000-scale), a pink urban tint overlay became necessary because so many buildings had been constructed in the area by 1994. The road infrastructure continued to develop as well, including the construction of State Highway 95 that loops around the western and southern sides of the city. Interestingly, Highway 95 is still the only way to get in and out of the area by car; an airport also serves the area. Comparing the Landsat image featured above to the 1911 map provides another fascinating way to study changes on the landscape for this area. (You can look at much more Landsat imagery on the NASA USGS Esri LandsatLook Viewer. The LandsatLook Viewer covers the entire planet, allowing for comparisons of many other areas modified by humans over time, back to 1972.) Looking at the Landsat image from 1975 (below, left) shows the newly-completed reservoir, but little in the way of urban development surrounding it. By contrast, by the time of the February 2015 image (below, right), development is clearly visible. Equally important are changes that are occurring on the landscape that are not visible in the maps and images. Every reservoir changes the water chemistry of the water stored in it and running through it, the cycle of seasonal flooding and erosion downstream, and the aquatic life from macroinvertebrates to fish that are supported. Has the presence of the reservoir altered the local humidity or other aspects of the local weather? 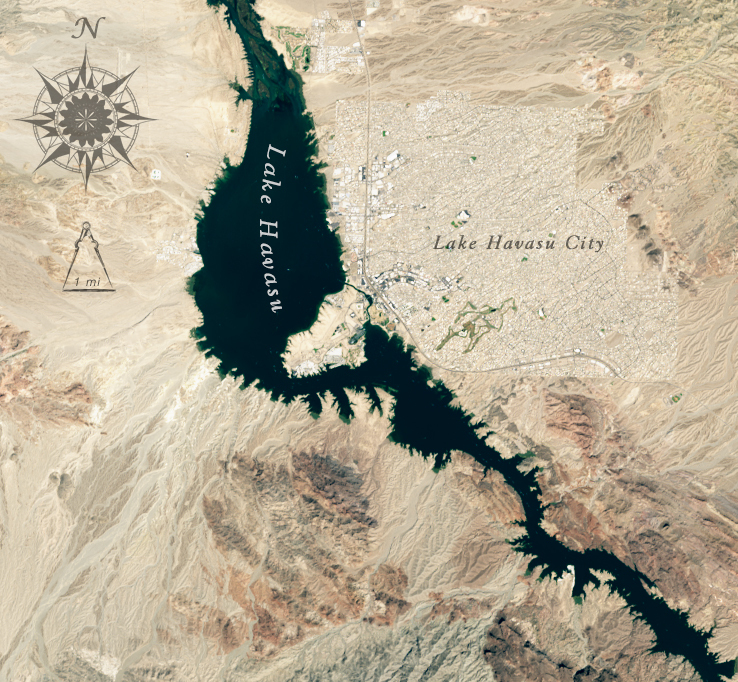 How has the growth of Lake Havasu City affected the groundwater level? How has the vegetation planted in the area altered the local ecosystem? What conservation efforts are in place? What economic activities has the city changed in quantity and in diversity both locally and regionally? How has the presence of Lake Havasu City affected national and seasonal migration of people? How have the demographics, or characteristics of the population, of Lake Havasu City changed over the past few decades? How are local planners addressing the future of the city? As explained in another article in Geographia, the advancement of cartographic technologies enables us to understand our world with data and tools that are increasingly at our fingertips. These examples provide an insight into a rapidly changing environment in the Mojave Desert. What area are you interested in examining with these same tools? 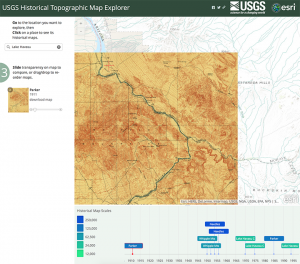 What can you discover with the USGS Topographic Explorer and LandsatLook about the place you are interested in? Is your selected place changing more rapidly or less rapidly than Lake Havasu City, and why? What will it be like in 25 years? 100 years?